The abstract expressionists were greater painters than prophets. The supremacy of abstraction lasted not a millennium, but barely a decade before it was overthrown by yet another revolution. The contrasting attitudes and practices of those who made these two revolutions produced distinctive patterns in their careers. Quantitative analysis can now yield deeper insight into the basic changes in the nature of painting that occurred in New York in the decades after WWII. The leaders of the next generation shared a set of conceptual attitudes and practices. Roy Lichtenstein's pop images of comic strips appeared to have little in common with Frank Stella’s parallel black stripes, but Lichtenstein explained that they had a shared basis, “that before you start painting the painting, you know exactly what it's going to look like.” In deliberate contrast to the personal gestures of the abstract expressionists, a common feature of the new art was impersonality –some of these artists used mechanical production, and others simulated it. Art history is the history of innovations – the most important artists are those who change their discipline, and their most important works are those that announce their innovations. The auction market values vast numbers of paintings. The prices it generates can be used to measure an artist’s creative life cycle – hedonic regression analysis can trace out an age-price profile for an artist, the peak of which identifies the artist’s most innovative period. 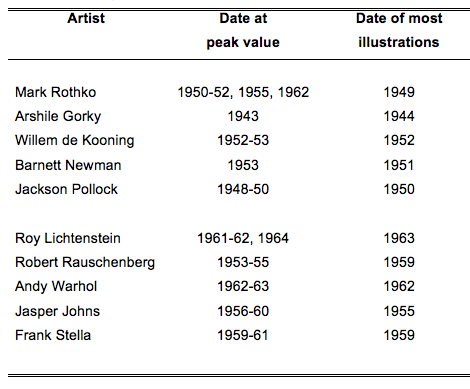 Table 1 presents estimates drawn from non-parametric regressions for the five leading artists of each cohort, as identified by art scholars. Using auction sales from 1980-2016, the natural log of a painting’s price was specified as a function of the artist’s age when he executed the painting, measured as a series of binary variables, with controls for the size of the work, its support, and its date of sale. Table 1 summarises the ages at peak value implied by the regressions. To compare these estimates to the opinions of art scholars, the table also includes the age from which each artist's work was most frequently reproduced in 50 textbooks of art history published since 2000. The two sources yield similar results, as the difference in estimated peak ages is within two years for 9 of the 10 artists. This supports the conclusion of earlier studies that there is close agreement between the auction market and scholarly judgments as to when important painters have produced their best work. Table 1 also points to a pronounced difference in the creative life cycles of the two cohorts. For example, the peak prices for three of the five abstract expressionists were for work done from ages 47-59, whereas those for three of the five of the second group occurred at ages 23-30. 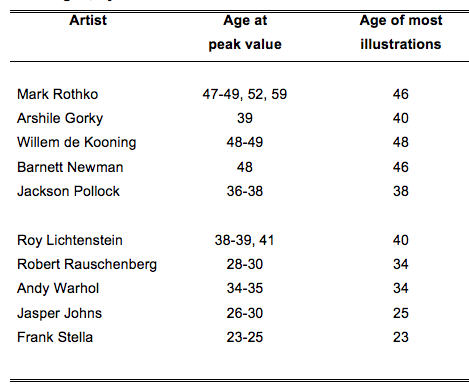 The median peak age of 46 for the abstract expressionists from textbook illustrations was fully 12 years above the median of 34 for the second cohort. Both sources thus indicate that experience increased the creativity of the experimental abstract expressionists, but decreased that of their conceptual successors. Table 2 shows the dates that correspond to the peak ages of Table 1. These neatly identify the high points of the two revolutions. The heyday of abstract expressionism – the creative peaks of its greatest members – began with Pollock's masterpieces of the late 1940s, and continued with the full development of de Kooning and Rothko in the early 1950s. But the next generation’s attack on abstract expressionism began almost immediately, with Rauschenberg’s invention of combines in the mid-1950s and Johns’ paintings of flags and targets in the late 1950s. The conceptual revolution reached its peak with the startling innovation of pop art by Lichtenstein and Warhol in the early 1960s. Shortly after the end of WWII, a small group of American painters made a revolution by creating bold new forms of abstract art, and in the process succeeded in making New York the centre of Western art. Their innovations were the result of extended experimentation, as they searched for personal techniques and images to satisfy their aesthetic goals, and they made their greatest contributions late in their lives – Pollock began to make his greatest works at 36, and the other leaders of the group entered their most creative periods from 39 through 48. Almost as soon as the revolution had been achieved, the abstract expressionists were challenged by a group of younger artists, who rejected their visual artistic criteria in favour of new forms of art based on ideas, often expressed with mechanical production, use of manufactured products, and images derived from photography. Their radical new ideas arrived early in their lives – among the leaders, only Lichtenstein made his greatest works past the age of 35, and three entered their most creative periods in their 20s. The abstract expressionists were outraged at being displaced by artists decades younger than themselves who had not had to toil in obscurity to earn their success, and whose art appeared to mock the art and values of their elders. But this second revolution swept through the advanced art world, and began an era of conceptual art that continues today. The sharp contrast between the highly personal art of the abstract expressionists and the impersonality and objectivity of their successors is well-known to art scholars, who have considered these revolutions to be beyond the reach of useful quantitative analysis. Now, however, quantitative evidence has provided a systematic basis for dating these revolutions, and creating a precise picture of the contrasting life cycles of creativity of the experimental old masters of Abstract Expressionism and the conceptual young geniuses of Pop Art. Galenson, D (2006), Old Masters and Young Geniuses, Princeton University Press. Galenson, D (2009), Conceptual Revolutions in Twentieth-Century Art, Cambridge University Press. Galenson, D (2017), “Pricing revolution: from Abstract Expressionism to Pop Art”, Becker Friedman Institute, Working paper 2017-14. Greenberg, C (1986), The Collected Essays and Criticism, Vol. 2, University of Chicago Press. Karmel, P (1999), Jackson Pollock, Museum of Modern Art. Rosenberg, H (1994), The Tradition of the New, Da Capo Press. Sylvester, D (2001), Interviews with American Artists, Yale University Press.